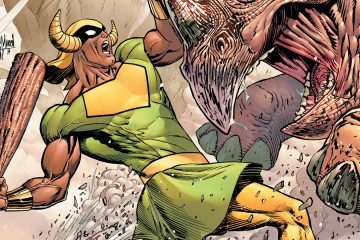 Check Out Our Exclusive Preview of OUTRAGE: Chapter 1! Social media, as we all know, can be a hellscape of trolls and the angry and entitled spewing hateful bile across the Internet. Have you ever been reading these comments online and wish you could confront whichever “brave” instigator behind a screen and a keyboard is bullying a person or persons? 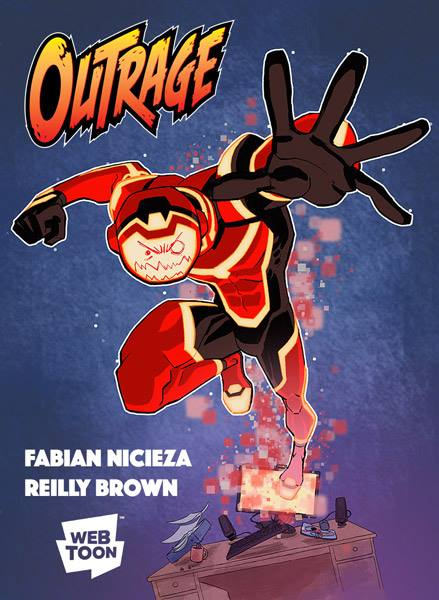 That’s the idea behind Outrage, a new webcomic coming from LINE Webtoon launching this Wednesday, September 12th, written by Fabian Nicieza, drawn by Reilly Brown, inked by Jake Leisten, colored by Matt Herms, and lettered by Pat Brosseau. In Outrage, an individual who can surf the Internet and physically appear at the source of the venom someone spews on social media decides to take matters into his own hands to clean up the web’s netscape. In honor of the webcomic’s debut, we’re proud to share with you our exclusive preview of Outrage Chapter 1! Outrage Chapter 1 debuts Wednesday, September 12th, from LINE Webtoon. LINE Webtoon (http://www.webtoons.com), the popular digital comics publisher pioneering the development and distribution of comics worldwide, today announced the development of Outrage, a brand new cyber-stalking comedy/mystery series from renowned comics creator and writer Fabian Nicieza (X-Men, Robin) and acclaimed comic artist Reilly Brown (Incredible Hercules, Amazing Spider-Man). The duo previously worked together on the hit Marvel Comics’ series Cable & Deadpool. 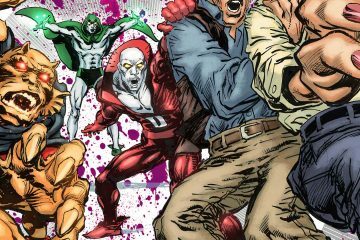 Best recognized as the co-creator of Marvel’s Deadpool and X-Force, writer Fabian Nicieza is familiar with drawing readers into the world of crime and justice. He has written and created dozens of storylines and characters for Marvel, DC Comics, and Dark Horse, including New Warriors and Thunderbolts. 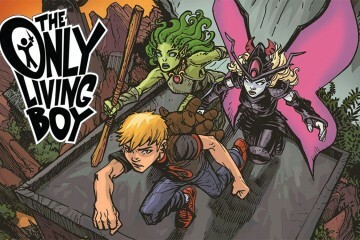 A comic book artist and illustrator who started self-publishing comics in 2002, Reilly Brown has since worked for Marvel, DC, Dark Horse, and Archie. 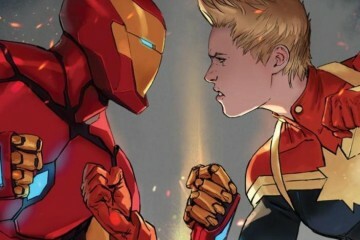 He is best known for his work on hit comic franchises such as Deadpool and Spider-Man. Brown is also a founding member of the Internet artist collective Ten Ton Studios. Their newest series, Outrage, is the story of a mysterious individual who can navigate the Internet and physically manifest at the source of the vile bile that spews throughout social media. Along with an array of weaponry limited only by his imagination, Outrage can exact a swift, merciless pummeling of anyone who triggers, humiliates, mortifies, stalks, hawks, balks or otherwise abuses someone on the Internet. And also, anyone who doesn’t know the difference between their, there and they’re. But who or what is Outrage? Why is he – or she – so angry? And can this mysterious entity be tracked down before the interweb explodes with violence? Outrage will surge onto LINE Webtoon later this year. To download the official LINE Webtoon app, visit the Apple App Store and Google Play. LINE Webtoon is the global leader in digital comics. LINE Webtoon is available on iOS, Android, tablets and web browsers. LINE Webtoon was launched by NAVER, Korea’s top search portal in 2004, and launched globally in 2014. To date, LINE Webtoon has over 10 million daily unique readers around the globe, and over 35 million monthly unique readers. Pioneering the distribution and consumption of digital comics worldwide, LINE Webtoon is taking the comic experience to the next level by providing readers with daily curated content, and giving creators an intuitive platform designed to help them easily publish and publicize their own original comics.